Sydney hip hop collective One Day have just dropped a new EP to get you in the mood for their upcoming Many Hands Tour. Ticket holders to their upcoming shows get an early and exclusive look at the EP as a “thanks for the continued support”. The Sydney collective are wide-eyed with what’s to come, fresh from opening for superstar Drake on his recent stadium tour, and feeling inspired, if a little fatigued, by the crazy response to their One Day Sundays block parties across the country. 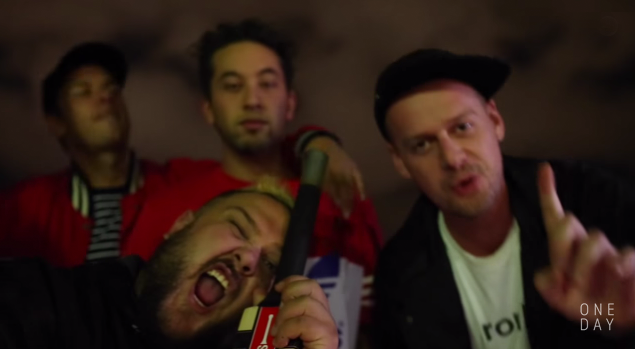 With gratitude, Horrorshow, Spit Syndicate, Joyride & Jackie Onassis have produced a track each, as well as the posse cut Oh Lord, released as a video earlier this week. You can grab the new EP for free download by following this link here.